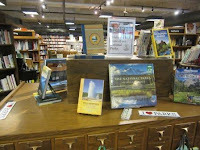 Boswell and Books: Display Tour--celebrating summer clearance, national parks, Soho mysteries, and the summer games. 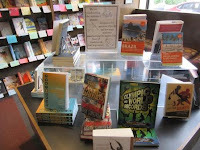 Display Tour--celebrating summer clearance, national parks, Soho mysteries, and the summer games. Though it seems like summer has just begun, a lot of folks look at July 4th as it's midpoint, particularly if they get out of school at the beginning of June and return by August. 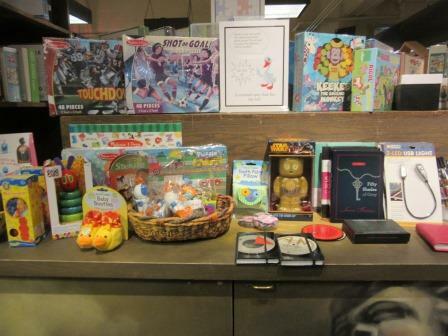 Whatever your calendar, Jen has set up a nice clearance display of gift items. 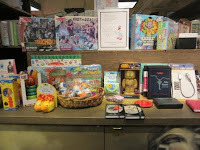 I have my eye on the Roz Chast mug, a toy robot for my collection, and the Beatles greeting cards. And note that some things, like one Gobblet Gobblers game, is only discounted 50% because of sun damage. We're open 10 am to 5 pm for both July 4th and Labor Day, and so far, traffic has been fairly what you'd expect for a holiday like this. It's a good amount of visitors, some brought to the store by locals, and others exploring on our own. We're in the Visit Milwaukee tourist map for the first time, and I'm hoping that makes an impact. 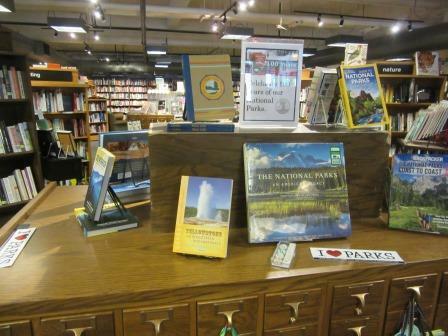 Our smaller National Parks display expanded to one of the larger tables, as Jason got the feeling that July 4th would lead to a publicity hit for this 100th anniversary. Sure enough, here's an essay in The New York Times travel section from Elaine Glusac and NPR has been doing a series of pieces on the centennial. I'm pretty sure there was something on this morning but I can't find it indexed yet. We're celebrating the 25th anniversary of Soho Press with a display featuring their titles. Clark printed us an 11x17 version of Soho's diagram of their publishing program, which each author identified by a distinctive color. We just hosted midnight blue, which would be Cara Black. 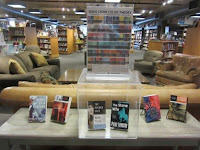 And finally, a display with a special challenge. 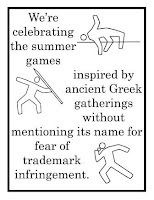 It seemed time to put up an Olympics display, but I've heard that the Committee often demands that retailers take down displays that use the word Olympics or show the rings, though I should note this is generally only in the city where the games are taking place. Just in case someone official shows up, I think we've addressed the problem pretty well. 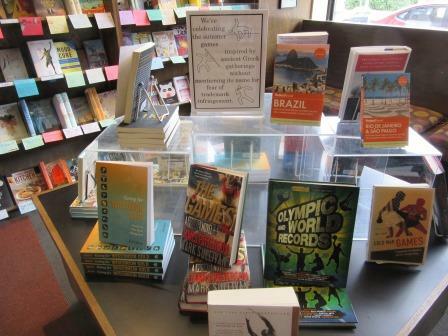 We're also promoting Jessie Garcia's for Going for the Wisconsin Gold: Stories of Our State Olympians. It's Wednesday, August 10, 6:30 pm, at Shorewood Public Library, 3920 N Murray Ave. 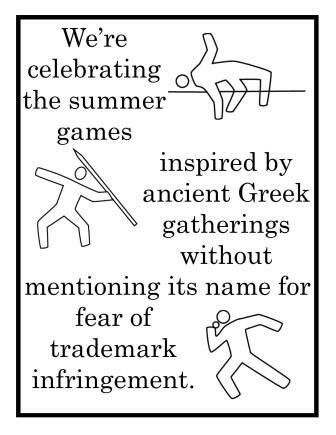 Here are some Olympics titles that are of note. According to the trademark info, if you are specifically referring to the mountain range, you are free to use the word in your branding, but you better be in Washington State! And of course Jason added a pile of Zika: The Emerging Epidemic, by Donald G. McNeil, Jr.